Are you craving an adventure but not sure what to do? We suggest going on a canoe trip in Wabakimi Wilderness Park and the Albany and Kopka Waterway Parks. Canoeing is a great way to explore the waterways, get closer to nature and get fit at the same time. 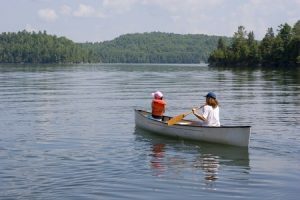 Canoeing is great for kids and adults alike since it’s a very accessible sport. Instead of taking your kids to a water park and feeling overwhelmed in the chaos of the lines, why not take your kids canoeing? Spend quality time with one another and make great memories that will last a lifetime. Wildlife is generally less shy around paddlers, so you’ll have the opportunity to get closer and spot animals that motor boats, walkers and cyclists rarely get to see. Not to mention, being in a canoe and floating out onto perfectly still water allows you to really be one with nature and nothing else will matter. You can take the time to reflect on life while searching for waterway wildlife. Canoeing is a low impact activity that improves your aerobic fitness, strength and flexibility, according to Better Health. Even if you’re just gently paddling, being outside and close to nature lowers your stress levels, can help you sleep better and make you a happier person overall. If we’ve inspired you to go canoeing and you want to take the next step, contact Mattice Lake Outfitters today where you can anticipate a truly spectacular wilderness setting. Whether you’re a pro fisher, nature photographer, or wilderness traveler we have a trip that will meet your expectations and more.